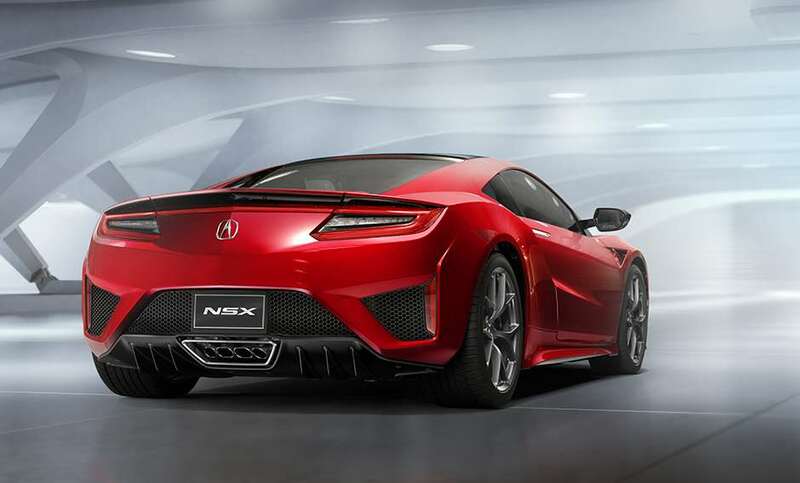 After seemingly endless teasers and previews, the production spec’ Honda NSX has been shown at the Detroit motor show. Designed and developed in the US, it will be built in the new Performance Manufacturing Centre in Ohio. It arrives 25 years after the original ground-breaking car, and once again features a mid-engined V6 with a lightweight body. In most respects, though, it innovates a long way beyond its forebear. The construction is a steel and aluminium spaceframe with a carbon fibre floor. A visible clue to the strong, lightweight structure is its thin A-pillars, a welcome development which, combined with a low scuttle should afford great visibility. The original NSX’s user-friendliness is a continuing theme, it appears. The V6 engine is assisted by no fewer than three electric motors. One sits between the engine and the 9-speed dual-clutch transmission, the other two are located on the front axle. They can deliver different amounts of torque to each wheel simultaneously, and similarly apply braking torque. No power figures have yet been released, but the best guess seems to be a total of around 550bhp. Let’s hope that Honda brings one to the Festival of Speed this year, ahead of the order book opening in the summer. Andrew Frankel: Is the Detroit Auto Show making a comeback? On Track In The Honda NSX – A Moving Science Lab? Alfa takes the roof off the 4C – and fixes the headlights, too!